The Fellowship Programme provides high-quality training by prominent international law scholars and practitioners on a broad range of core topics of international law. In addition, the interactive nature of the training allows the participants to share experiences and exchange ideas, which promotes greater understanding and cooperation on contemporary issues of international law. The Fellowship Programme is intended to enable qualified professionals, in particular, government officials and teachers of international law from developing countries and countries with emerging economies, to deepen their knowledge of international law and of the legal work of the United Nations. The Fellowship Programme is conducted in English or French. The 2019 Programme will be conducted in English. Candidates who are not government officials can be nominated by the institution which they work for or with which they are affiliated. 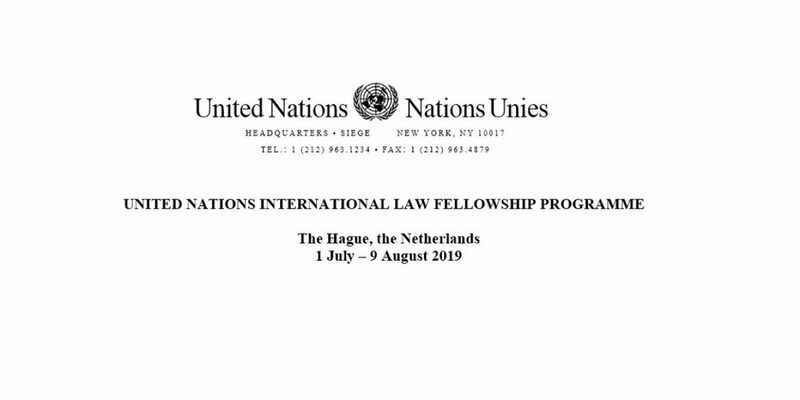 The fellowships cover the fellowship recipient’s travel costs in economy class, accommodation, medical insurance, participation in the Fellowship Programme, the training material and the registration fee for The Hague Academy of International Law. In accordance with the policies and procedures governing the administration of United Nations fellowships, participants will also receive a stipend to cover other living expenses. Qualified candidates may also apply for self-funded positions. Self-funded participants bear all costs associated with their participation (travel, accommodation, living expenses and registration fee for The Hague Academy of International Law). Training materials are provided to all self-funded participants free of charge.